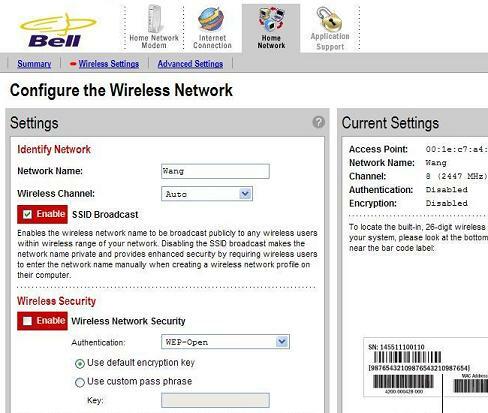 This section provides a tutorial example of how to view and change wireless connection settings with the DSL modem acting as a home network gateway. The Ethernet Network - Up to 4 computers can be connected to Ethernet ports of the gateway modem with Ethernet cables. The Wireless Network - Many computers can be connected to the wireless receiver of the gateway modem without any cables. The configuration of the Ethernet network part is very simple. So let's review the configuration of the wireless network part only. 2. Click the "Home Network" icon on top of the page. The home network summary page shows up. 4. Change the Network Name to "Wang". Keep SSID Broadcast enabled so that my laptop can see the wireless network named as "Wang". 5. Change the Wireless Network Security to be enabled and keep the "Use default encryption key" radio button checked. From now on, when connecting my laptop to Wang's wireless network, I need to enter the default encryption key, which is printed on the back of the modem.